Pauline De Cruz, also known as Yan Mee Lin, was born in 1944. 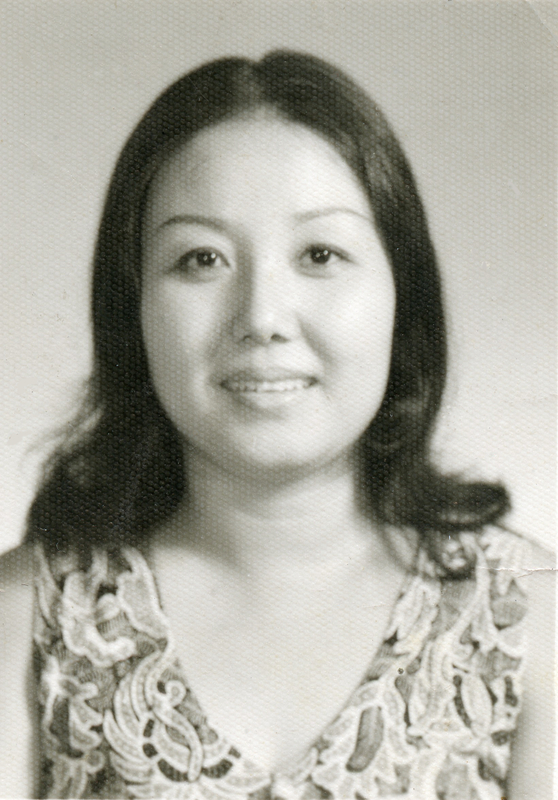 She was the youngest of the 5 daughters of Yan Kee Leong – the first enlightened Bahá’í in Peninsula Malaysia. So, in a way, destiny had already mapped out her life of service. She grew up as a Catholic but embraced the Faith of Bahá’u’lláh in 1961 and chose nursing as a profession. She first received the message from Yan Kee Leong himself. 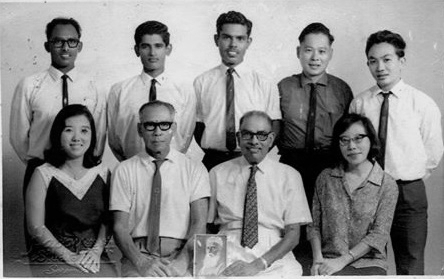 From the early days of her acceptance of the Faith, Pauline had received a good foundation through the deepening sessions provided by Yankee Leong, Pauline’s firmness in the Faith was further elevated by meeting many Hands of the Cause of God who came to Malaya, starting with Tarazullah Samandari whom she met in Malacca in 1961. 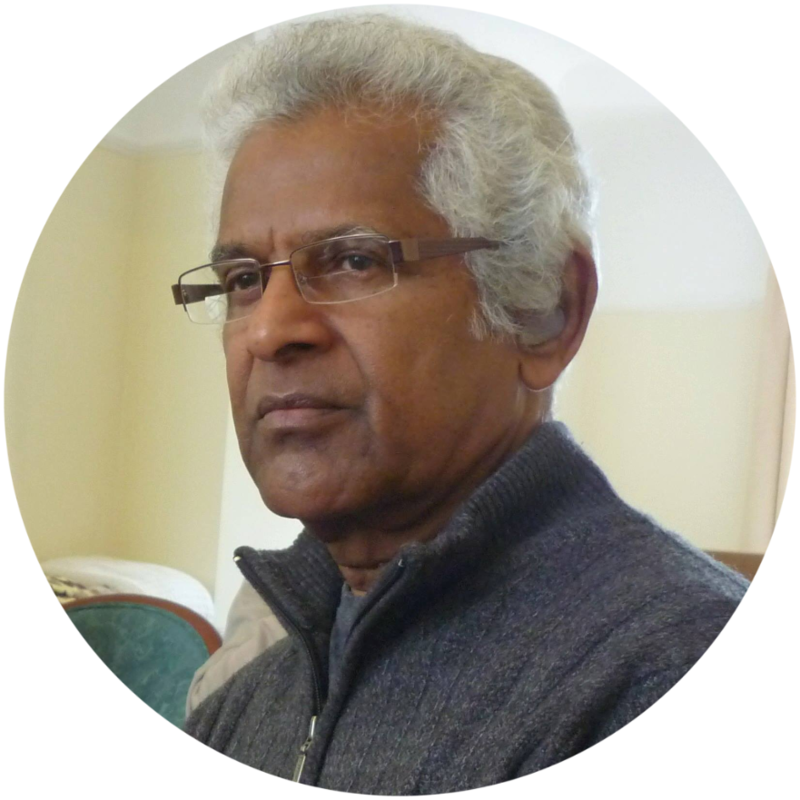 Tarazullah Samandari was the only living Hand of the Cause to have met Bahá’u’lláh in person. Some of the other Hands whom she met in her lifetime were were Mr. Collis Featherstone, Mr. Enoch Olinga, Dr. Muhajir, Mr. A.Q. Faizi, Mr. Jalal Khazeh, Amatul Baha Ruhyyih Khanum, Furutan, and Muhammad Varqa. Meeting and listening to these Hands of the Cause created a deep impact on her soul. Pauline had tremendous love and respect for several elders in the community who had sacrificed much for the Faith of Bahaullah. 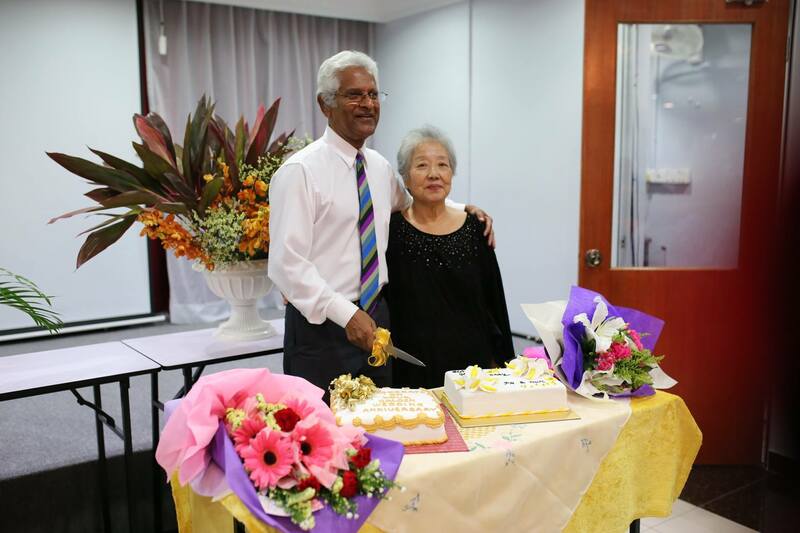 Among those valiant souls, Pauline developed a special love and admiration for the late Counselor Inbum Chinniah and always enjoyed his company. 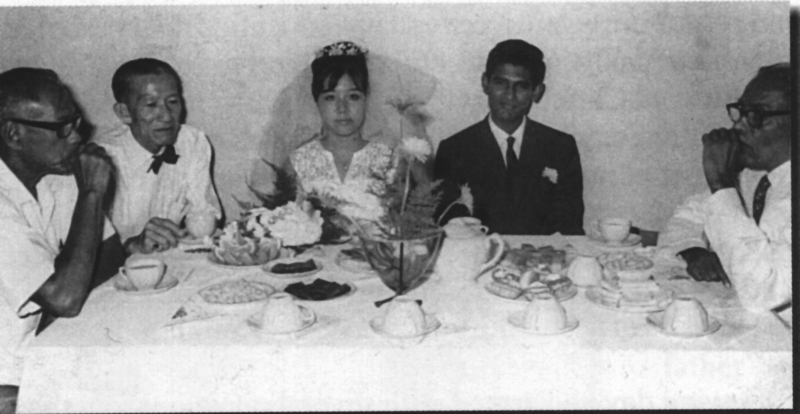 On 20 February 1966, I had the honour of becoming her husband – she was everything I could have asked for in a woman – and from then on, her life was completely devoted to the Faith and her family. By 1974 we had 3 children – (5 actually, but our twins passed away soon after birth in 1974) – Terence, Charmaine and Felina now scattered in three different areas of the world – Malaysia, New York and London respectively. From the moment we were wed, her sense of sacrifice, service and servitude became apparent. She carried on in her nursing profession while she had two children and saw me through university at the same time. On completion of my degree at the University of Malaya and finding employment as a teacher, Pauline decided to give up her profession and devote her time to the family, and it was then that her devotion to the Cause of God began to take shape and blossom. We served on the Assembly of Seremban. Seated L-R: Pauline, Poi Eng Siew, K. Rajah, Lily Ng. 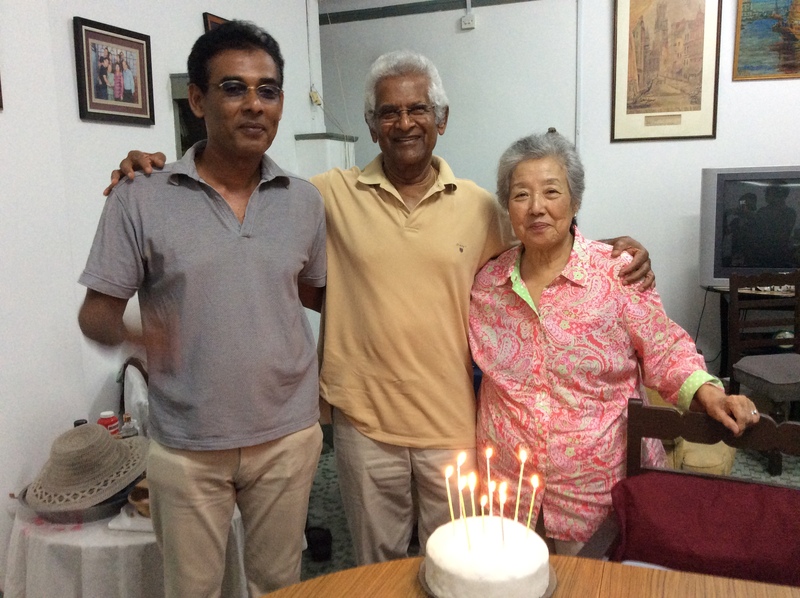 Standing – Mariappan, Isaac De Cruz, Vishnupatham, Lee Teck Seng, Jack Tan. Pauline acquired a unique culinary gift, and with her sense of generosity and an over-abundance of joy, she also became adept at listening patiently to people pouring out their hearts. These would become her trade-mark contributions to the Faith she loved. 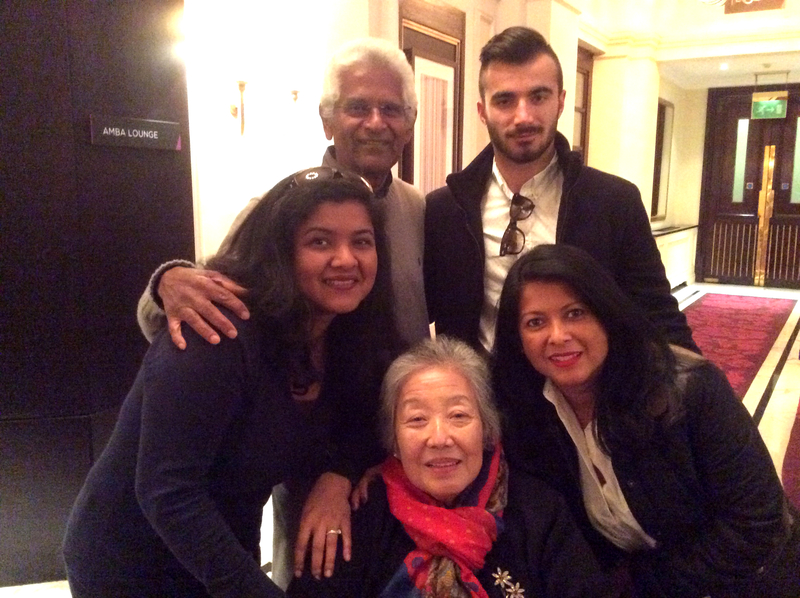 In the late sixties and early seventies she started cooking at Bahá’í Summer and Winter gatherings in Malaysia – at times even for crowds of 500 participants. During all the time she was in Malaysia, our home was always open to friends, relatives and enquirers. Her simplicity and sincerity attracted many. 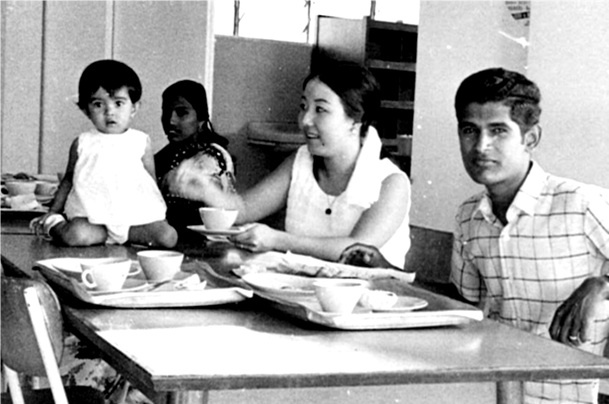 And in the 1970’s, our home was designated a centre for the housing, feeding and deepening of the Aboriginal Bahá’ís of Malaysia whenever training sessions were organized for them in Seremban. The way Pauline managed to house and feed these 15 or so regular arrivals on a bi-monthly basis from the mountain villages of Peninsula Malaysia to her small, 2 bedroomed house in Seremban was in itself a miracle. When the perennial problem of catering for the children aged 10-14 years came to be addressed through holding a Pre-Declaration Institute in the year 1972, Pauline played the role of “mama” of the Institute. The tender love she had for children made Pauline a natural choice for this role. A lasting impression in her life was attending Jenabe Caldwell’s 9-Day Institute with me in Penang. 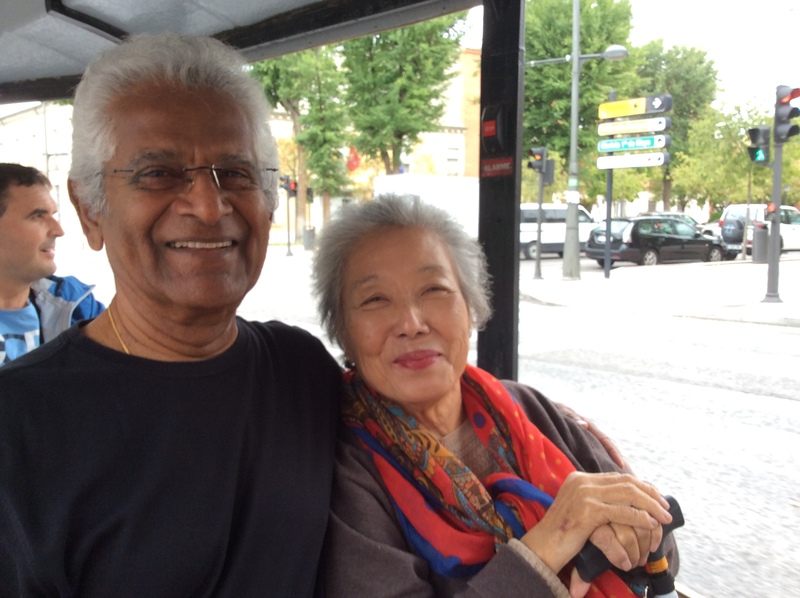 Hers was a truly radiant acquiescence during my frequent absences away on teaching trips to the aboriginal mountainous areas, to Eastern Malaysia, South-East Asia, and other Asian and African countries for days, weeks and even months at times. This prompted Mrs. Elizabeth Gibson, a lovely family friend from USA who was in Malaysia for two years from 1970, to once remark that Pauline was one of the most unselfish wives she had ever come across. 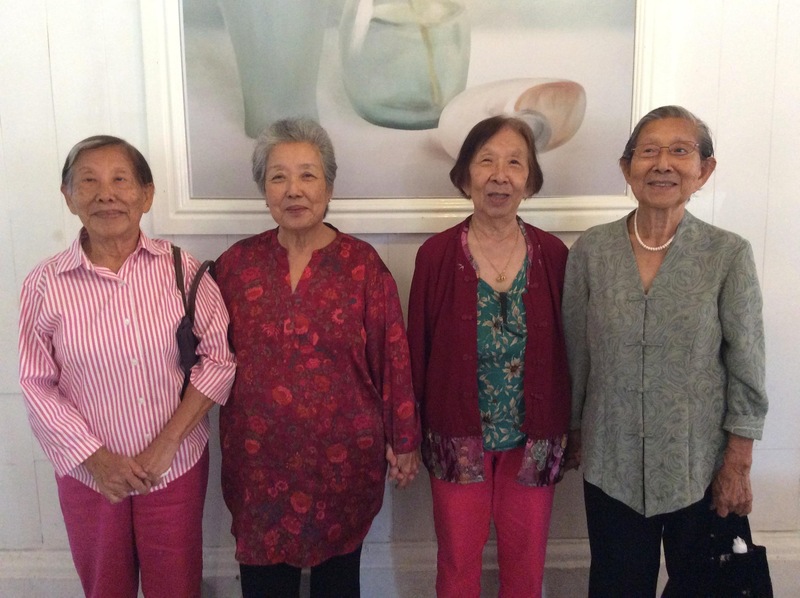 Proud daughters of Yankee Leong who served the Cause with distinction. Then in the early 80’s, she uprooted herself and with her children, joined me studying law in London. Again she worked while I completed the final year of my law degree. And for 3 years, she made our home in East London, a hub of Bahá’í activity. In 1988 November, we moved to Liverpool, Pauline taking up a full-time post as Assistant Co-ordinator to work with me on an out-reach Project for the next 5 years for the National Spiritual Assembly of the Bahá’ís of the UK. Her loving hospitality, generosity, culinary skills and her outstanding sacrificial service were recognized and deeply appreciated by friends from all over the UK. It was at this time that she encouraged me to complete my LL.M while she held the fort at the Bahá’í Centre during the two days a week I was away completing my postgraduate degree. In 1994, the Project was discontinued and while I managed to get a full-time job as a lecturer at the Liverpool Community College, both of us were asked to stay on at the Bahá’í Centre buildings on a volunteer basis and so, she continued her unwavering service to the Cause of God. In the process, she created a spiritual home for countless souls passing through the doors of the Centre buildings in Liverpool. Throughout the 25 years at this place, she not only became responsible for the physical maintenance of the Centre, but also of catering for countless courses and mini winter and summer schools, and large receptions held at many venues for Bahá’ís and enquirers in Liverpool. Indeed, Pauline’s was service in its purest sense – unheard of and unsung. And all this despite being plagued with ill-health. She was not only a kidney-transplant patient, but a diabetic as well, and with a heart that contained 3 faulty valves. Her limbs too were riddled with arthritis. Yet, no despair, no moaning – only a cheerful disposition all those years. From 2015 onwards Pauline’s health began to deteriorate yet she managed to visit Spain, Malaysia, the US and the Wilmette House of Worship. We last went to Malaysia to participate in the Bahá’í Summer School there in December 2016 and stayed on in that country, visiting communities. It was during this trip that Pauline fell ill with pneumonia and was admitted to hospital. After a prolonged period of treatment, she recovered slightly and was flown to UK. After battling for life she passed away on 8 May, 2017, plunging hundreds of Pauline’s friends all over the world into deep sorrow. Following a befitting funeral ceremony Pauline was laid to rest in the cemetery in Arnos Grove, London, in the vicinity of the Resting Place of the beloved Guardian. Pauline, during her days among the friends of Malaya. She was then married with two little children. And without fully realising it, your life of service and sacrifice was an eloquent witness to God’s latest Revelation and the Words above, and an enduring legacy to me, your children, your grandchildren, your sons-in-laws and the large “family” in all the 3 continents. You and I have journeyed through the highest mountains and the deepest valleys of life, and despite the storms that have battered our family, and the tests and trials that came our way, our love has come through because of your huge, forgiving heart. You have been the family’s main-stay and my precious life-long companion. I am humbled and lifted to have walked and served alongside you all those years and am proud beyond words at your sterling example of love and sacrifice. You have beautified and enriched all our lives. As you have done all these years, Leen, keep us going, and keep us serving. The treasure-chest of memories of your infectious love and joy of life that you have left behind, will become our most valued jewel, and will be the spur for us to act and to serve the Cause of God and humanity. There are no words to describe the loss of our mother. There are only indescribable feelings. Feelings that make our insides melt for she was our everything. Our strength, our compassion, our loyalty, our love, our laughter, our light, our joy. Mum was a strong woman, direct but loving and caring with a wonderful sense of humour. She was, as described by a friend ‘larger than life’. She was a force of nature, indomitable, and had a great sense of fun and mischief. She cooked like no other and all 3 of us are privileged to have taken on her culinary skills. Although mum had no particular interest in sports, she could have won an Olympic medal for talking, as many of her good friends and family would attest to. She had the gift of the gab and somehow was able to have complete strangers share their life story with her within their very first conversations – she truly had a compassionate, open heart. Growing up, we were taught strong values and the importance of family, faith, hard work, kindness, tolerance, generosity, forgiveness and love. 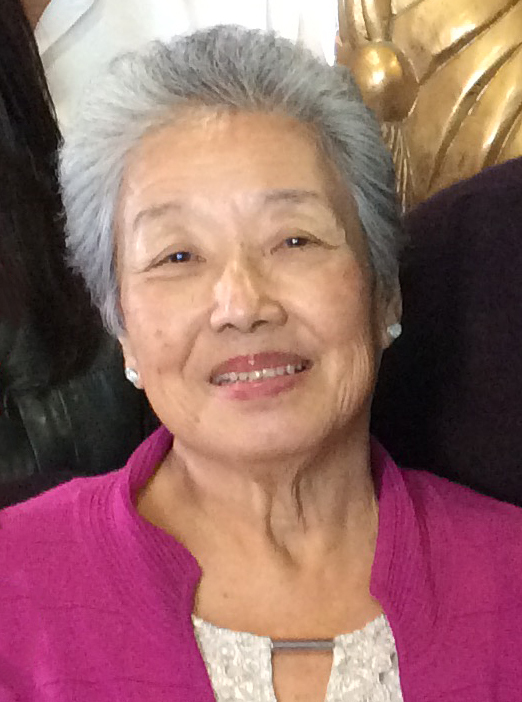 Family, and her role as wife, mother and grandmother, was the most important thing to Mum. This is where she drew her strength and left her legacy. Being with her family was what Mum enjoyed most of all. Her life had some obstacles, and she struggled for over 20 years with a sometimes debilitating illness. Yet through it all, her love and caring for her family remained her focus and she sacrificed everything for her children. This perseverance through adversity is a powerful lesson for us all and what better way for all who knew her to continue this legacy of loving and caring for your family and letting them know in all the ways you can show them, that you love them, by not letting adversities or setbacks or any of the distractions of the world keep you from this most important aspect of life. With our daughters Felina at left and Charmaine on right, with her son, Cassian. Our mum was a remarkable and very special woman and I doubt she ever realized how many people she had an impact on in her lifetime. We may sound greedy to want more days with our mum, who had more than her allotted time, but mum leaving us so soon does not diminish, it only magnifies the enormity of the room whose doors have quietly shut. The emptiness now echoes where once the sound of her voice and laughter rang. Mum we miss you beyond measure! The only comfort we have is that mum is up there ‘talking’ to family and friends, old and new, that she is no longer in pain and Bahá’u’lláh says ‘days of blissful joy, of heavenly delight, are assuredly in store for you. Worlds, holy and spiritually glorious, will be unveiled to your eyes’. It’s hard to say goodbye mum, It feels like we have loved you for a thousand years and we will love you for a thousand more, so until we meet again, continue to guide us, give us strength and pray for us as we pray for you.